Anshu Kumar from Hajipur, B.E. - B.Tech Graduate. Anshu Kumar is Engineer and currently have no work experience. ELECTRONICS AND COMM.. MATLAB AND SQL SERV.. ARDUINO C/ C++ VHDL AND VERILOG. GO.. MICROPROCESSOR 8085 MICROCONTROLLER 8051..
are one of expert skill area's of Anshu Kumar . 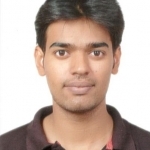 Anshu Kumar is working in IT Software industry.